Not pictured here are some small personal items that always make the trip: spare pair glasses, blower and brush for sensor cleaning, iPod Touch & Kindle, GPS…it all fits with room for a couple of extra lenses for special applications. The camera bag that I detailed in the previous post is just part one. 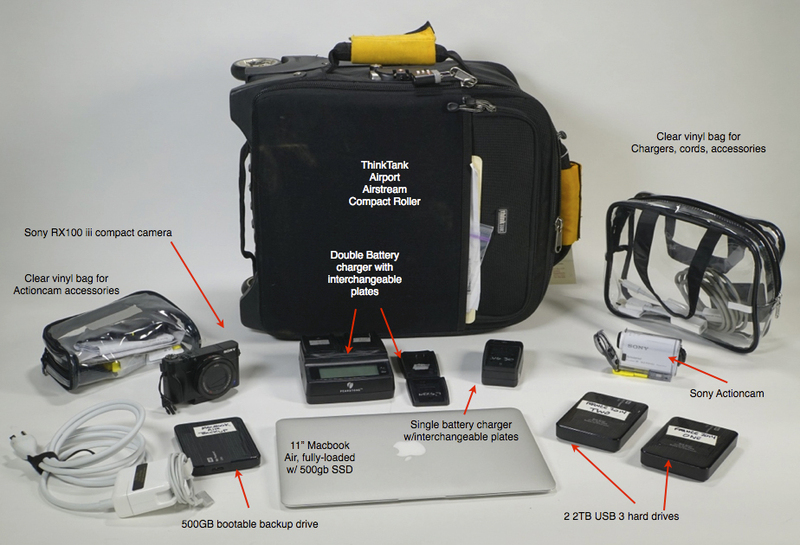 These days, nobody can travel without a bag o’ electronics too. I used to use a larger laptop, a larger rollaboard, but in my never-ending quest to go smaller and lighter (with gear, if not in person), this is my latest configuration, and it works pretty well. 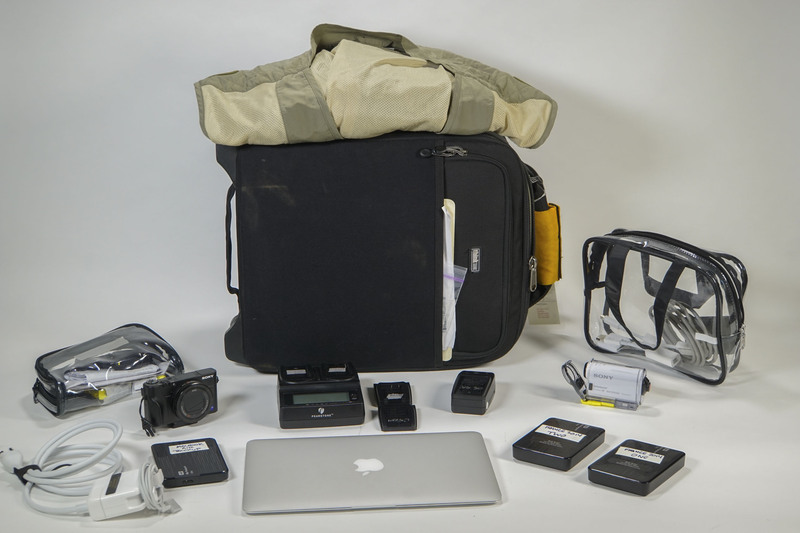 In this second bag go two other cameras I try not to leave home without: my Sony RX100 iii, and my Sony Actioncam. 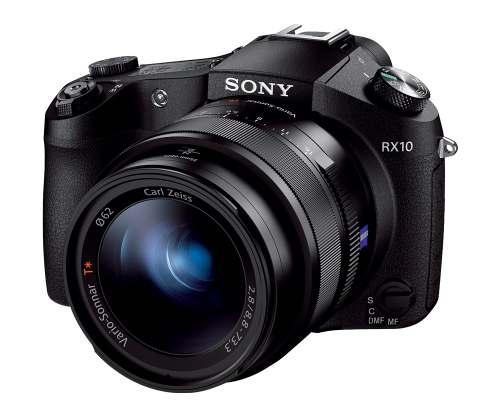 If we were all perfectly honest with ourselves, we’d admit that cameras like the Sony RX 100, and the top-of-the-line Canon and Nikon compacts, would really be good enough to shoot 95% of what most publication photogs need to do, but we’re not. We’re pros, so we need big, expensive gear. If we don’t show up with a lot of gear, nobody will believe us. This system is built around a top of the line, 11″ Macbook Air with a 510GB SSD at its core, with 8GB of RAM (the most the 11″ will take) and the fastest processor. I can edit video on this thing (although I prefer a much larger screen) on the road if need be and it’s so tiny and flat I can often stuff it in the back pocket of my camera bag if need be. I keep a 500GB USB3.0 backup boot drive just in case, and I back up my SDXC cards to two 2TB USB 3 drives on the road…I also try not to reuse the cards, either, so I have three copies of everything from an assignment. Battery chargers can proliferate faster than a gang of stoned bunny rabbits, so I settled on a battery charging system a while ago. It’s offered by B&H under the Watson brand (used to be Pearstone) and I have a double battery charger and a single one. All you do is switch out the battery plates, rather than carry separate chargers, for all the different devices. I have plates for all my Sony cameras, my Nikon cameras, and even the LED panel batteries can be recharged on this device. It is a huge space saver. (Wait, that’s an oxymoron, but it’s true!). It’s all carried in ThinkTank’s smallest rollaboard, the Airport Airstream. 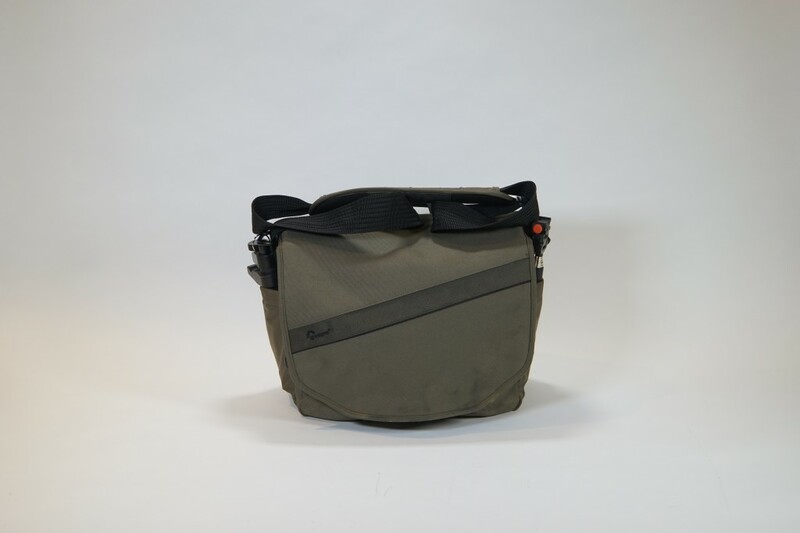 Damn, those ThinkTank people make great bags. Expensive, but rugged and well designed. And finally, as the piece de la resisistance that illustrates the depth of my paranoia, er, I mean my preparedness, I always fold up one of the lightweight, supplex nylon photo vests that I designed for LL Bean about 15 years ago (they stopped carrying it right after 9/11, when a lot of their travel gear was discontinued) and put it in this bag. 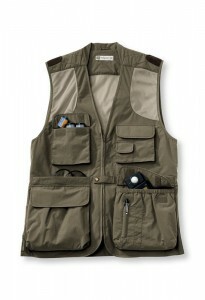 It’s similar in design to the Domke vest with one important and vastly superior difference…it’s NOT made of heavy, old-tech cotton duck that absorbs and holds every ounce of sweat like a sponge, and so it weighs nothing, folds down to nothing, and wicks moisture away from your body instead of making you carry it around like a water-bearer (c’mon Tiffen/Domke, get with the program…cotton duck material went out with the British Raj in India, for crissakes, and you’ve been trying to sell it in this vest this for 20 years). You can substitute the vest of your choice, or if you’re lucky, find one of mine on EBay…but be warned they fetch collector’s item fees…the few extra I have are so valuable, they’re figuring into my estate planning:-). 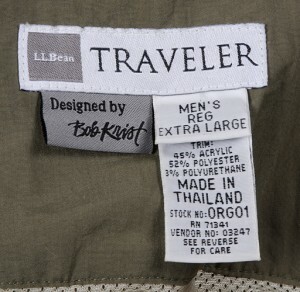 Now, should I run into a foreign airline on a connection that strictly enforces a “one carryon and one carryon only” rule (and it has happened about 3 times in my career), I can take everything in this rollaboard and put it in the big pockets of my vest, and literally “wear” my second carryon onto the plane, while giving them an essentially empty bag to check. It’s not foolproof, of course, but it’s worked for me and as I said, it’s a bailout tactic that you can use when your back is against the wall. It’s not easy lugging gear around on what is essentially a family vacation. But when you get a chance to go to someplace as exotic and photogenic as Bali, it would be crazy not to take advantage of the photo (and video) ops that abound on this beautiful island. And so, when I planned my kit for a recent trip to this Indonesian island with my two sons and my brother, a trip that was essentially going to be a boogie boarding safari, I knew that the pounding Balinese surf wouldn’t be the only thing I’d be shooting. 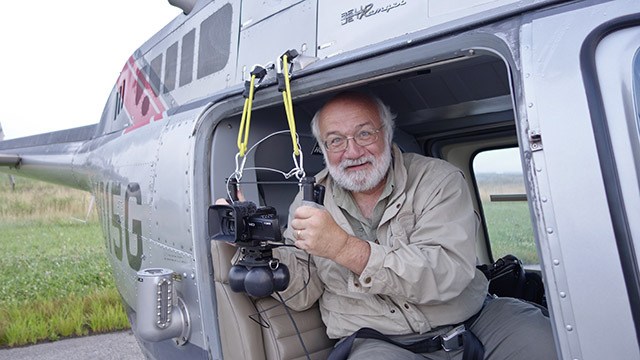 …and unlike that daring young man on the flying trapeze, my moves may not be graceful, all girls I cannot please, but damn, I can produce some pretty nice-looking aerial HD video for clients who can’t afford the big, nosemounted, two-man crew, aerial Hollywood video helicopter setups when they need views higher than the growing army of DJI drone-ographers can get them. Preparing to shoot aerial video of Atlantic City and surrounding areas on the Jersey Shore. There are three factors that help me compete with the big boys. Four great still-Shooting feats my sub-$1K mirrorless can do that my $3K DSLR can’t…. Yes, this blog is about the issues you deal with when a still shooter dips his or her toe into the movement pond, but sometimes you just have to shake your head at the advances in still shooting that mirrorless cameras with electronic shutters allow that seem to be glossed over or not covered (or maybe it’s just that I’m not reading that many stills blogs). But there are four killer features on certain mirrorless cameras with electronic shutters that every still shooter should know about, and rejoice. Especially when you keep in mind that we’re talking about a sub-$1000 camera and lens combo that weighs next to nothing…. 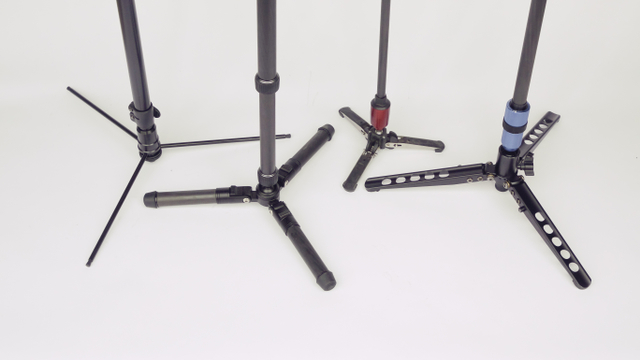 Left to Right: the foldout legs of the Oben, the Varizoom “Chickenfoot,” the Manfrotto original, and the Sirui.